Both these streets have become “places”, through the growth of cafés and popular eateries as well as a variety of boutique stores. 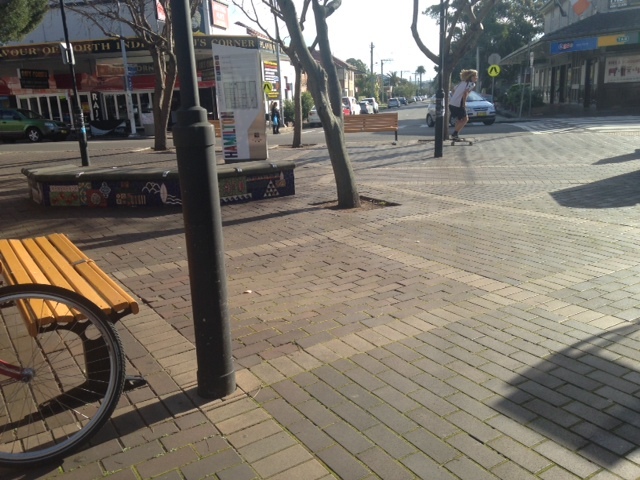 They are also both strip shopping streets for local inner city suburbs and both have a clearly demarcated zone, defined by major intersections and the presence of cafés and restaurants, where traffic is most concentrated and where close mingling of pedestrians, car drivers and cyclists is most likely to take place. 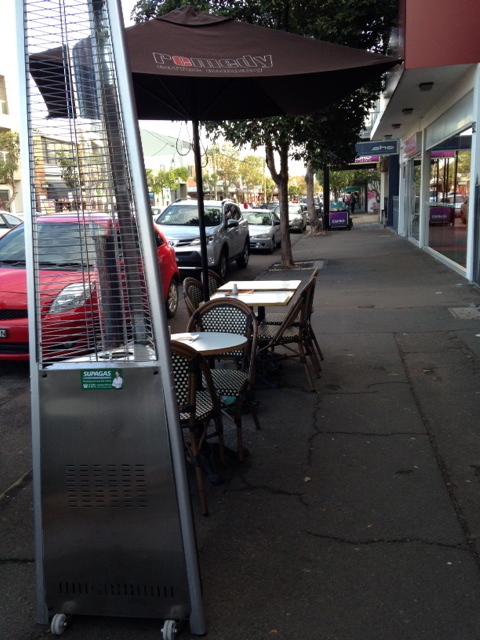 Both streets have a 40k speed limit in this zone and both have pavement seating and tables belonging to the cafés. Of these two streets, I prefer Beaumont, from my viewpoint as a cyclist, (although as pedestrian and cafe patron, either street works very well). The traffic on Beaumont Street moves slower and there seems to be more space on the road for cyclists. This is no doubt partly because of the greater number of cross streets, and while this might seem contradictory, the cross streets slow down traffic and create an opportunity for cyclists to move over to the left to allow cars to pass. They also create pedestrian crossing opportunities, slowing down cars further; and breaks in the line of parked cars, enhancing visibility for cyclists and car drivers. I’ve written about riding along this street here. 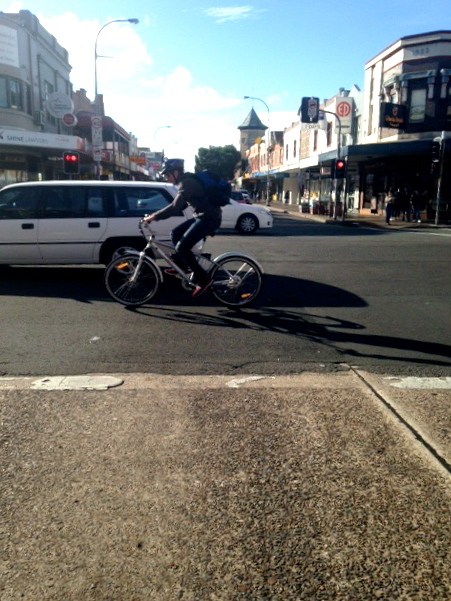 In Darby St, the single pedestrian crossing is at the traffic lights in the middle of the busiest part of the street. This means that pedestrians have to walk to the crossing, then wait for the lights to change, both of which take time. The traffic is therefore regulated more, although there are times when cars have a red light and no pedestrians are crossing, hindering the flow of traffic for no apparent reason. The unlighted and speed humped pedestrian crossings on Beaumont St. work better in these circumstances. Jay walking is fairly common on both streets, although this is not a bad thing as traffic moves slowly. “Places” work better when people either walk or ride a bike to them, as it decreases the number of cars in the vicinity and increases the opportunity for human interaction. There is more residential housing close to Beaumont St and it has the additional advantage of a train station, dropping off pedestrians, and sometimes bike riders, nearby. A place does not work as well if you have to get there by car, and if, once you are there, you have to search for parking, as the charm of the place is broken by these demands. Both these streets have on street parking and nearby back streets, sufficient to hold plenty of cars. Buskers often add to the ambience in Beaumont St. Both these streets work well as places but, to me, Beaumont works a little better. 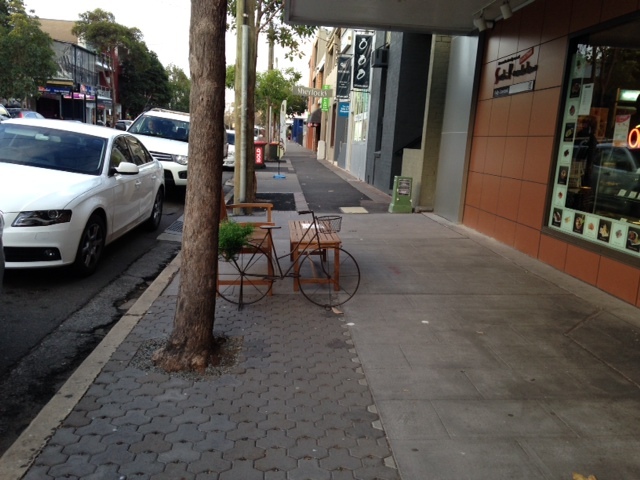 This entry was posted in Uncategorized and tagged Beaumont St, Darby St, hamilton, newcastle, placemaking, places in Newcastle. Bookmark the permalink.